Hello and welcome to Take Aurally, the podcast from NUH DREEAM; winner of Health Education England Education Team of the Year 2017. 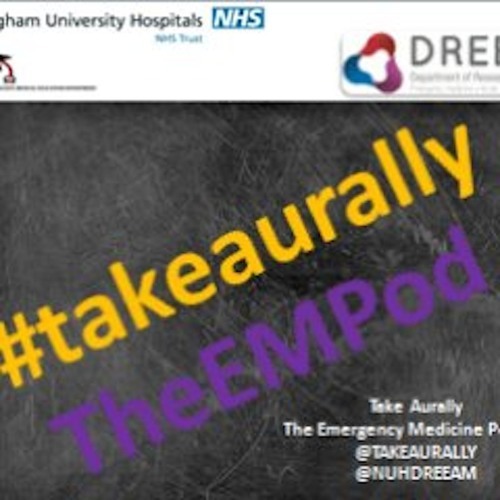 Take Aurally started as a podcast for Emergency Medicine but has grown to cover large parts of the clinical curriculum for students at the University of Nottingham; everything from ENT to Therapeutics. Whether you're a student or a practitioner looking to refresh their memory Take Aurally is for you! All information is correct for Nottingham University Hospitals NHS Trust, other trust guidelines may vary. All opinions are the speaker's own. Visit www.takeaurally.com for blogs and more resources. Find us on Twitter and Facebook.